I need to create the life I want on my own terms … and the really cool thing I am! And I’m still hungry as I type this however, I also know I need to FEEL DISCOMFORT in the beginning of any release … the discomfort will pass and I will feel good. I need to let go of the Need and allow myself to have … all in good time. It’s really crazy but the is so much truth in the Power of AFFIRMATIONS!! I use them a lot and so many things that I can feel – see happening – really does occur. Sometimes in ways that I wouldn’t expect … that’s ok – – because it doesn’t really matter the HOW …the end result is right now! And all the needs to be happening right now is ENJOYING the human experience and being a positive aspect of others human experience … I DIGRESS! I was writing my gratitude list and I HAD one of the most amazing SPONTANEOUS affirmation thoughts I could ever imagine … and I see this happening! so i needed to post it ! 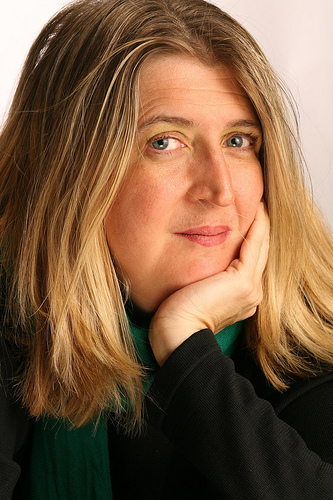 Trickydame Productions is a LLC and earns over 100k by year 2 in biz! I’m curious to see how this will happen … all I know right now is I’m also going TO ENJOY making this happen. Enjoy YOUR LIFE …it’s what you have right now! Each day is yours to begin a new … what else can you do – die?! I’m not ready to leave this planet just yet so this is why TODAY I chose to enjoy the life I’ve created ….Today I live my life WELL! When I was 12 years old, I had a Green button with big White letters ERA that I wore on my jacket. I still have the button and below is a water color painting I did of it a few years ago. 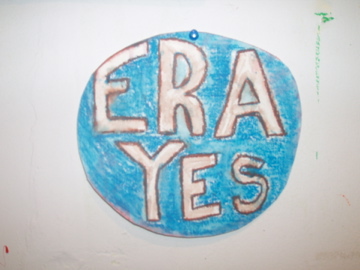 The other day in my studio, a young woman in her 30s saw the painting and said out loud, “era now” – she asked “What era is now?” …I explained to her that it’s not “era” but rather “E – R – A” – the Equal Rights Amendment – – funny how it’s still not past even though we are in the 21st Century! All of the talk about HOPE with the Obama Presidential campaign – only gives me some hope that SOMEDAY SOON – we will have a new amendment to add to the US Constitution. When dealing with the MAN MADE LAWS – it’s important to have this amendment passed – yes, with UNIVERSAL LAWS – we know we are all equal – we are all ONE! However, there are some humans who don’t understand the Universal Laws and need the MAN MADE LAWS to understand how to treat each other. It is possible… it is. The Equal Rights Amendment, first proposed in 1923, is still not part of the U.S. Constitution. The ERA has been ratified by 35 of the necessary 38 states. When three more states vote yes, the ERA might become the 28th Amendment. seriously …. just relax. It’s just life. It is a time of a lot weird crazy stuff happening (NOTE: Not the first time in HUMAN HISTORY!) in the world … focus on what makes you feel good and take action to change the things that don’t make you feel good. 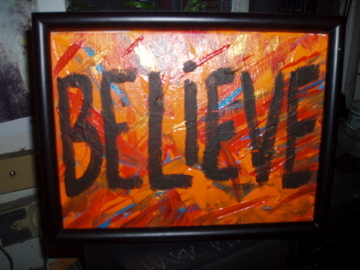 BELIEVE … in what makes you shine!